The Tampa Downtown Partnership launched a pass today providing a discounted tour of the arts and entertainment in downtown Tampa. For $30, the Tampa Downtown Arts & Entertainment Pass will give you one admission to the Tampa Bay History Center, the Tampa Theatre, the Florida Museum of Photographic Arts, the Henry B. Plant Museum, a BOGO ride on the TECO Line Streetcar ride, and premiums at six different downtown restaurants. 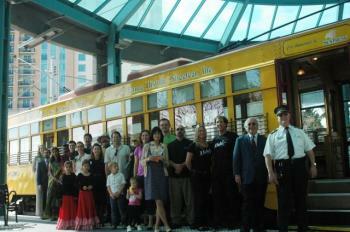 The Tampa Downtown Partnership, along with the participating venues, officially launched the pass on a TECO Line Streetar today with characters from each museum (pictured right). The pass is valued at $78 and is valid April 1 through September 30. Passes can be purchased at any of the above art venues, the Tampa Downtown Partnership office, or the Official Visitors Center in Channelside.